All prosthetic implants are subject to some degree of wear and corrosion in the body. Wear is a mechanical process resulting from changes in load distribution and micro-motion, while corrosion is an electrochemical process of metal degradation. Certain types of corrosion, such as fretting, occur when chemical and mechanical factors, including crevice and abrasive wear, act on the implant. Both wear and corrosion result in debris release from the implants into the surrounding tissues and subsequently into the human circulation, and can manifest with local and systemic reactions which, over time, may demand revision of components. Although numerous studies have focused on the clinical significance of corrosion and wear of hip and knee replacements, research involving spine instrumentation is not well documented. 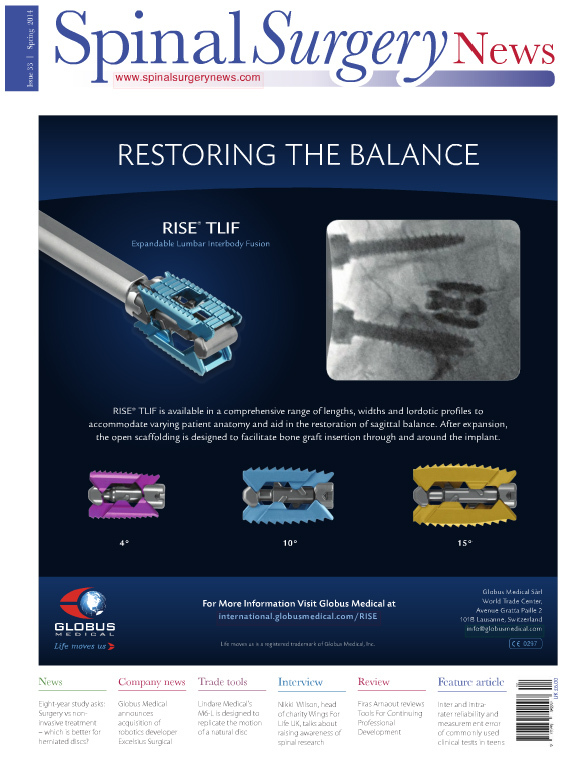 Recently, we received spine instrumentation, with cobalt–chrome (CoCr) rods with titanium (Ti) fixtures, of a 36-year-old female patient (Figure 1). She was diagnosed with adult idiopathic scoliosis (Figure 1A); however, soon after surgical implantation (Figure 1B) she experienced persistent pain and muscle fasciculation. Surgeons recommended removal of metalwork after two years of implantation, where intra-operatively they discovered metal staining of the periprosthetic tissue. We analysed the retrieved components in our facilities, and this case will serve here as a running example. This article aims to demonstrate the importance of retrieval analysis of corroded spinal components (Figure 2) in combination with clinical examination findings, medical imaging, blood and tissue analysis in understanding the mechanisms in the multifactorial cause for failure in spinal surgery. implant, patient and surgeon factors that contribute to increased corrosion and wear of spine implants. Several case reports have been published on revision of spine components where the reason for revisions were strongly linked with corrosion and wear of the implants [1–7]. Medical complications included unexplained pain, neurological effects, implant loosening, implant failure, swelling and metal staining of the skin. In 2005, Tezer and co-workers reported the revision of stainless steel (SS) spine instrumentation due to intraspinal metallosis leading to paraparesis during the third post-operative year . Retrieval analysis of the components revealed crevice and fretting at the junctions between rod and fixtures. Imaging, histological and tissue analysis, combined with intra-operative assessment, revealed a granulomatous mass made of metal debris, macrophages and giant cells pressing the spinal cord, leading to lower limb paralysis. Symptoms ceased soon after the implant was removed. There are two earlier case reports on patients with neurologic symptoms that resolve soon after the removal of the instrumentation ; in both cases, soft tissue samples were composed of metal debris and macrophages. In a further case, a paediatric patient with scoliosis was revised twice for persistent pain six and 12 months post-operatively, respectively . The first revision was after radiological diagnosis of implant failure, while the second revision was performed to remove soft tissue mass. Histological analysis of tissue taken during revision revealed metal debris and presence of macrophages. In this case, pain was associated with unstable fusion and implant loosening. Gaine and others  reported six cases of later operative pain associated with debris release from SS implants. 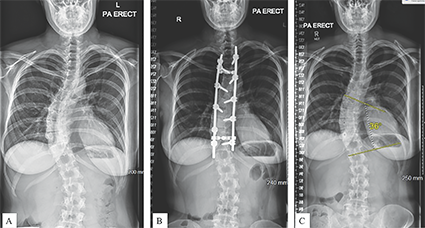 Recently, a review of spine metallosis included a case report of spinal metalloma in a patient with titanium spine implants. The reason for revision was severe lower back pain and lumbar radiculopathy. Intra–operative findings included scar tissue and a granulomatous mass, both removed for analysis, while histological analysis concluded that this was a case of spinal metallosis . These case reports conclude that corrosion and wear are independent of materials used in spine instrumentation. Reactions to metal debris can vary from late operative pain to neurological complications, while spine metalloma seems to be the common denominator. In comparison with the spine instrumentation of our case example, the patient was revised for persistent pain and muscle spasms which have not been resolved with the removal of metalwork. During revision surgery, metal staining of the periprosthetic tissue was observed. Tissue samples were taken and sent for histological analysis (Figure 3). Here we will address (i) the mechanisms that link corrosion and wear of implants with local and systemic effects, as well as (ii) how corrosion and wear manifest and can be identified in current clinical practice. Metal debris can either stay locally or circulate in the bloodstream. In the case of local reactions, macrophages form giant cells that ingest the metal debris – this is probably an immune mechanism for managing the effects of metal presence in the body. In addition, wear debris is also suspected to be responsible for bony loss (osteolysis), affecting the interface between implant and bone and hence resulting in implant loosening and pain. In the case of circulation in the bloodstream, metal ions bound with proteins or in the form of salt solutions travel to remote organs, setting in motion systemic reactions, such as metal hypersensitivity, carcinogenesis and toxicity. Generally, different particles and ions stimulate different reactions. For example, cobalt is suspected to lead to cellular apoptosis and necrosis [8,9], and aluminium is associated with seizures and epilepsy  and is strongly linked with Alzheimer’s disease , while titanium inhibits osteoclastic activity, accelerates osteoclastic differentiation and causes osteolysis . In clinical practice, evaluation of imaging and blood test results can serve as indications of corrosion and wear in spine implants, although they are not established as part of the routine monitoring of patients. In most case reports with corroded and worn spine instrumentation, computed tomography (CT) myelography showed the presence of soft tissue mass, which was later identified as metalloma. In studies involving total disc replacements, ion levels in blood were found comparable with the values measured in patients with total joint arthroplasties, suggesting a similar wear rate. Single photon emission computed tomography (SPECT) combined with CT scanning is used to detect changes by identifying the reasons behind early or late increased uptakes on the scans. 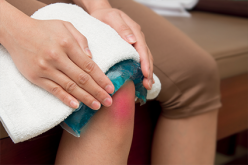 Early increased uptake is a sign of possible infection, whereas late uptake serves as an indication of implant loosening or increased bone activity. Increased uptake could be an indication of increased vascularity due to inflammatory reaction to metal debris. Future work, combining retrieval analysis with assessment of advanced imaging, is needed. Laboratory tests for metal ions in blood are not part of the routine clinical practice in spine surgery – compared with hip reconstructive surgery for patients with metal-on-metal implants. A study measuring metal concentrations in the serum and hair of patients with Ti spine implants was inconclusive: only one-third of the patients had abnormal metal concentration in serum, compared with one-fifth of the patients with abnormal results in hair. When patients with failed instrumentation and abnormal blood test results were compared with patients with well-functioning implants and abnormal test results, there was no significant difference, suggesting that blood tests could not be used as an accurate diagnostic tool for implant failure . However, even the presence of metal ions in the blood indicates that debris from spine instrumentation can enter the bloodstream, so more work is needed to correlate blood metal ions with corrosion and surface degradation. In our case example, no blood was taken during the implantation period for counting the metal ion concentrations in order to determine whether metal ions are released due to wear of the components. Only a year after removal of the metalwork, blood tests revealed 14nmol/L for whole blood Cr and 3nmol/L for whole blood Co, while Ti levels were undetectable (<10nmol/L). Imaging during implantation revealed good level of fusion (Figure 1B), which suggested the removal of components without fear of recurrence of scoliosis. CT and MRI scans during the implantation did not show any signs of failure of the metalwork, such as implant loosening or fracture of any component. A year after the revision surgery, MRI scan did not reveal any soft tissue mass consistent with the presence of pseudotumour, as a reaction to metal debris release. Figure1: (A) Pre-operative radiograph of the patient showing progressive scoliosis. (B) Post-primary radiograph of the patient showing the metalwork from T3 to T11, including two rods, 11 screws and two connectors. (C) Post-revision radiograph showing progression of scoliosis. Figure 2: Highly corroded junctions on spine retrievals, with signs of (A) corrosive debris (blue arrow) compared with unworn areas (green arrow); (B) corrosive deposits (blue arrow) in higher magnification; and (C) fretting (yellow arrow) and pitting (red arrow). Figure 3: Histological analysis at different magnifications showing presence of macrophages and giant cells with ingested wear particles, consistent with adverse reaction due to wear and corrosion of spine implants. Most papers on retrieval analysis focus on total disc replacements, although there are a few studies investigating spinal rods from scoliosis patients. In this section we will review retrieval studies in spine instrumentation, as well as preliminary findings from our work at the London Implant Retrieval Centre (LIRC). Preliminary results from an international repository for retrieved total disc replacements showed wear in both metal-on-poly and metal-on-metal disc replacements. Chemical reactions such as corrosion in metal components and oxidation in poly components were identified. The histological examination of tissue concluded inflammatory response to metal and poly debris after fusion . 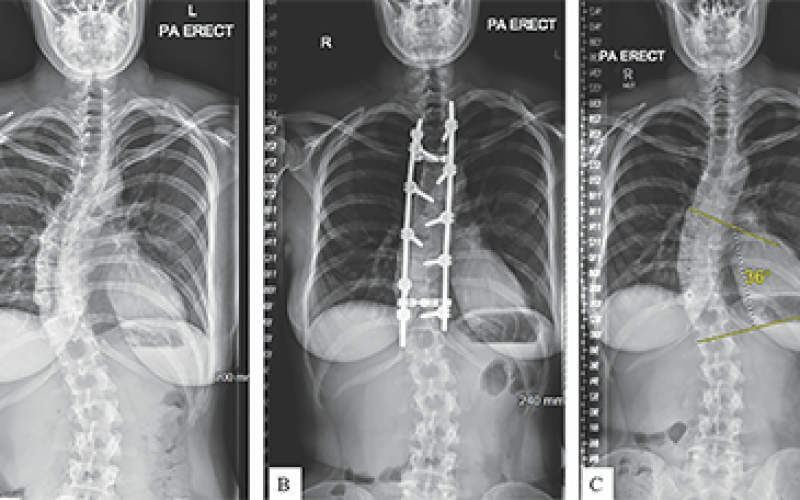 Spinal rods made of SS from 11 patients were revised and retrieval analysis was performed. Corrosion and fretting were present at the rod–screw junctions in all constructs, but were more evident on implants with longer time of implantation. The authors suggested that corrosion can be more rapid in cases where spinal fusion is not achieved compared with fusion cases . Surface analysis of retrieved spine implants made of SS, Ti and CoCr alloys suggested that all components were corroded; however, implants made of SS were found to be more susceptible to corrosion and wear than the Ti and CoCr implants. The types of corrosion identified were fretting and crevice; no signs of galvanic corrosion were found . Preliminary results of the forensic analysis in retrieved spine implants received in our centre showed fretting and pitting in most of the components, regardless of the time of implantation and the material alloy. Macroscopic and microscopic inspection has identified rod–fixture junctions as areas of potential fretting, pitting and corrosion. Scanning electron microscopy (SEM) together with energy dispersive X-ray spectroscopy (EDX) are used to identify surface changes and deposit composition, respectively. Analysis of elemental composition of debris and deposits will help us identify their either corrosive or biological origin. We are working on identifying the role of corrosion and wear in the failure of the magnetically controlled growth rods. Published and anecdotal reports of metallosis presented intra-operatively suggest that the rods are subject to wear and corrosion, while debris migrates to surrounding tissue and causes staining. In the running example, we macroscopically and microscopically assessed the retrieved components for signs of fretting and pitting. We identified 15 sites of interest on the rod, which were caused from screws, nuts, hooks and connectors. Most of the junctions on the rods were moderately to severely damaged. In comparison with CoCr rods revised for infection, the junctions were more damaged in terms of severity and extension, suggesting a link between tissue reaction and corrosion and wear due to implantation. Microscopic analysis showed fretting and pitting, while EDX showed Ti transfer from the Ti fixtures to the CoCr rods. On the other hand, there were no signs of increased corrosion due to galvanic coupling when compared with constructs made of Ti rods with Ti fixtures. We aim to proceed with the retrieval analysis with measurements of material loss to quantify the volumetric loss on the junctions. Research in retrieved hip replacements suggests that implant failure is multifactorial; the same is true for corrosion and wear of spine components. Spine surgery is more complex than hip surgery because of the complexity of the spine anatomy compared with the hip, the variety of deformities and diseases that affect the spine column and the increased forces applied to components, especially in the case of deformities. Research into hip retrievals provided guidelines and recommendations for better monitoring of patients and improved pre-surgical planning [17–20]. Similarly, retrieval analysis combined with analysis of clinical, imaging and laboratory data, will improve pre-operative planning and monitoring by identifying the warning signs of potential or early failure of spine instrumentation. Research on hip components revealed that implant material and design, including the combination of dissimilar materials in the same construct, can be a decisive factor for the failure or not of the implant [7,21]. There have been some case reports in the literature suggesting that increased modularity in spine instrumentation is suspected to be linked with the presence of metallosis – by providing more junction sites for wear and corrosion, thus increasing the amount of metal release , especially in the case of movement in the junctions. 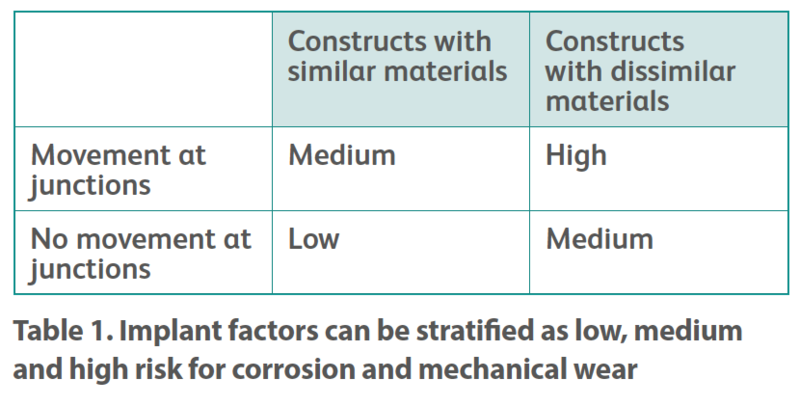 The implant factors for corrosion can be stratified as low, medium and high risk as seen in Table 1. 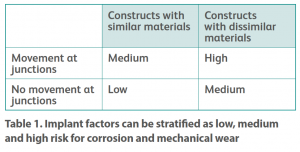 Table 1: Implant factors can be stratified as low, medium and high risk for corrosion and mechanical wear. Current clinical practice allows the use of components made of dissimilar materials, especially in the treatment of adult deformities, making the most of physical and chemical properties of the materials. The galvanic coupling of different alloys in a corrosive environment is assumed to accelerate the degradation of components; however, pre-clinical testing and preliminary results of retrievals show no evidence of galvanic corrosion for different combinations of materials [22,23]. Research into hip implants reveals that some patients are more sensitive to metal debris than others, suggesting that these patients are more prone to present with adverse tissue reactions [8,9]. In spine surgery, however, there is very sparse data available on this subject. One possible patient risk factor is bone quality, which can determine the time required for spinal fusion. Wear and corrosion debris are linked with osteolysis [6,14,24], but it is not clear how poor-quality bone is affected by wear and corrosion compared with good-quality bone . Smoking is suspected to have an effect on the process of bone fusion, but has not yet been correlated with the failure of spine implants . Takahashi S, Delécrin J, Passuti N. Intraspinal metallosis causing delayed neurologic symptoms after spinal instrumentation surgery. Spine. 2001;26(13):1495-8. Tezer M, Kuzgun U, Hamzaoglu A, Ozturk C, Kabukcuoglu F, Sirvanci M. Intraspinal metalloma resulting in late paraparesis. Archives of orthopaedic and trauma surgery. 2005;125(6):417-21. Gaine WJ, Andrew SM, Chadwick P, Cooke E, Williamson JB. Late operative site pain with isola posterior instrumentation requiring implant removal: infection or metal reaction? Spine. 2001;26(5):583-7. 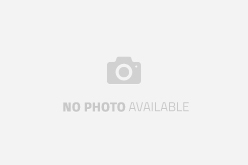 Goldenberg Y, Tee JW, Salinas-La Rosa CM, Murphy M. Spinal metallosis: a systematic review. European Spine Journal. 2016;25(5):1467-73. Senaran H, Atilla P, Kaymaz F, Acaroglu E, Surat A. Ultrastructural analysis of metallic debris and tissue reaction around spinal implants in patients with late operative site pain. Spine. 2004;29(15):1618-23. Botolin S, Merritt C, Erickson M. Aseptic loosening of pedicle screw as a result of metal wear debris in a pediatric patient. Spine. 2013;38(1):E38-E42. Jones CS, Stokes OM, Patel SB, Clarke AJ, Hutton M. Actuator pin fracture in magnetically controlled growing rods: two cases. The Spine Journal. 2015. Cheung A, Banerjee S, Cherian J, Wong F, Butany J, Gilbert C, et al. Systemic cobalt toxicity from total hip arthroplasties. Bone Joint J. 2016;98(1):6-13. Zywiel M, Cherian J, Banerjee S, Cheung A, Wong F, Butany J, et al. Systemic cobalt toxicity from total hip arthroplasties. Bone Joint J. 2016;98(1):14-20. Zatta P, Lucchini R, van Rensburg SJ, Taylor A. The role of metals in neurodegenerative processes: aluminum, manganese, and zinc. Brain research bulletin. 2003;62(1):15-28. Tomljenovic L. Aluminum and Alzheimer’s disease: after a century of controversy, is there a plausible link? Journal of Alzheimer’s Disease. 2011;23(4):567-98. Yao J, Cs-Szabo G, Jacobs JJ, Kuettner KE, Glant TT. Suppression of Osteoblast Function by Titanium Particles*†. J Bone Joint Surg Am. 1997;79(1):107-12. Kasai Y, Iida R, Uchida A. Metal concentrations in the serum and hair of patients with titanium alloy spinal implants. Spine. 2003;28(12):1320-6. Kurtz SM, Steinbeck M, Ianuzzi A, van Ooij A, Punt IM, Isaza J, et al. Retrieval analysis of motion preserving spinal devices and periprosthetic tissues. SAS journal. 2009;3(4):161-77. Akazawa T, Minami S, Takahashi K, Kotani T, Hanawa T, Moriya H. Corrosion of spinal implants retrieved from patients with scoliosis. Journal of Orthopaedic Science. 2005;10(2):200-5. Kirkpatrick JS, Venugopalan R, Beck P, Lemons J. Corrosion on spinal implants. Journal of spinal disorders & techniques. 2005;18(3):247-51. Hothi HS, Berber R, Panagiotopoulos AC, Whittaker RK, Rhead C, Skinner JA, et al. Clinical significance of corrosion of cemented femoral stems in metal-on-metal hips: a retrieval study. International orthopaedics. 2016:1-8. Hart A, Muirhead-Allwood S, Porter M, Matthies A, Ilo K, Maggiore P, et al. Which factors determine the wear rate of large-diameter metal-on-metal hip replacements? J Bone Joint Surg Am. 2013;95(8):678-85. Berber R, Skinner JA, Hart AJ. Management of metal-on-metal hip implant patients: Who, when and how to revise? World journal of orthopedics. 2016;7(5):272. Berber R, Henckel J, Khoo M, Wan S, Hua J, Skinner J, et al. Clinical usefulness of SPECT–CT in patients with an unexplained pain in metal on metal (MOM) total hip arthroplasty. 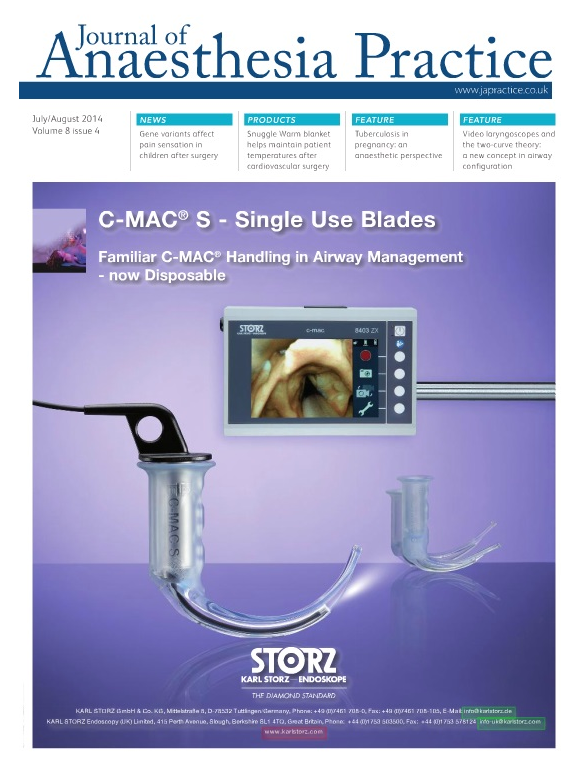 The Journal of arthroplasty. 2015;30(4):687-94. Hothi HS, Whittaker RK, Meswania JM, Blunn GW, Skinner JA, Hart AJ. Influence of stem type on material loss at the metal-on-metal pinnacle taper junction. Proceedings of the Institution of Mechanical Engineers, Part H: Journal of Engineering in Medicine. 2015;229(1):91-7. Mali SA, Singh V, Gilbert JL. Effect of mixed alloy combinations on fretting corrosion performance of spinal screw and rod implants. Journal of Biomedical Materials Research Part B: Applied Biomaterials. 2016.
erhan H, Slivka M, Albert T, Kwak SD. Is galvanic corrosion between titanium alloy and stainless steel spinal implants a clinical concern? The Spine Journal. 2004;4(4):379-87. Hallab NJ, Cunningham BW, Jacobs JJ. Spinal implant debris-induced osteolysis. Spine. 2003;28(20S):S125-S38. Boden SD, Sumner DR. Biologic factors affecting spinal fusion and bone regeneration. Spine. 1995;20:113S. Vasiliki Panagiotopoulou is a postdoctoral research associate with a background in chemical and biomedical engineering. She is currently in charge of developing a spine retrieval project at the LIRC, which is based at the Royal National Orthopaedic Hospital. 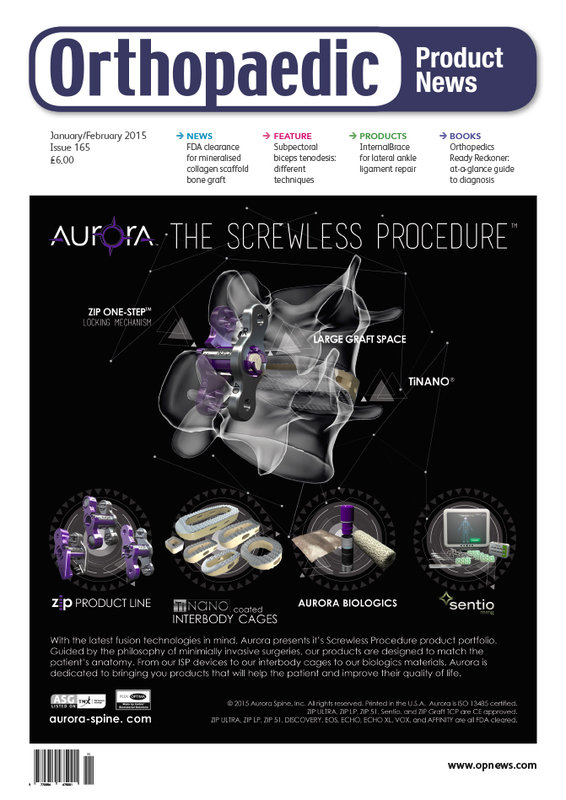 This has led to the submission of the first retrieval paper for the analysis of the failure mechanism of magnetically controlled growth rods, and the submission of the first retrieval paper for corrosion in similar and dissimilar materials (CoCr and Ti components), collaborating with 16 consultant surgeons from 10 hospitals in the UK and abroad. Our multidisciplinary group of engineers and surgeons is working on investigating the potential surgical, implant and patient risk factors for different types of spine implants, by combining clinical, imaging, histological and retrieval analysis. 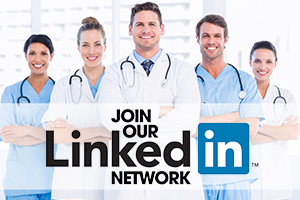 LIRC is based at Royal National Orthopaedic Hospital (RNOH), working in close collaboration with the RNOH spinal unit, which is a centre for referrals of complex cases, both in a national and an international level. We are also collaborating with senior spine surgeons and several hospitals across the country, including Great Ormond Street Hospital and Queens Medical Centre (Nottingham). Our project has led to the collection of more than 500 components of spine instrumentation, from pedicle screws and magnetically controlled growth rods to intervertebral bodies and disc replacements, with relevant clinical and imaging data, all consented by the patients. We are using state-of-the-art engineering methods to inspect retrieved components and to identify signs of corrosion and material loss, using facilities at UCL. We currently have four abstracts under review for upcoming international conferences (AAOS, ORS and ICEOS), with nine spine surgeons as co-authors. We have two podium presentations at the Annual Meeting of British Scoliosis Society in October. Since LIRC was founded in 2007, its impact on hip reconstructive surgery has been well established. We have published more than 80 papers with over 200 co-authors in peer-reviewed journals, at a rate of a paper a month, and presented more than 200 times in national and international conferences. Our research has influenced the monitoring of patients with hip implants, as we are working towards identifying the SIP factors for hip implants. 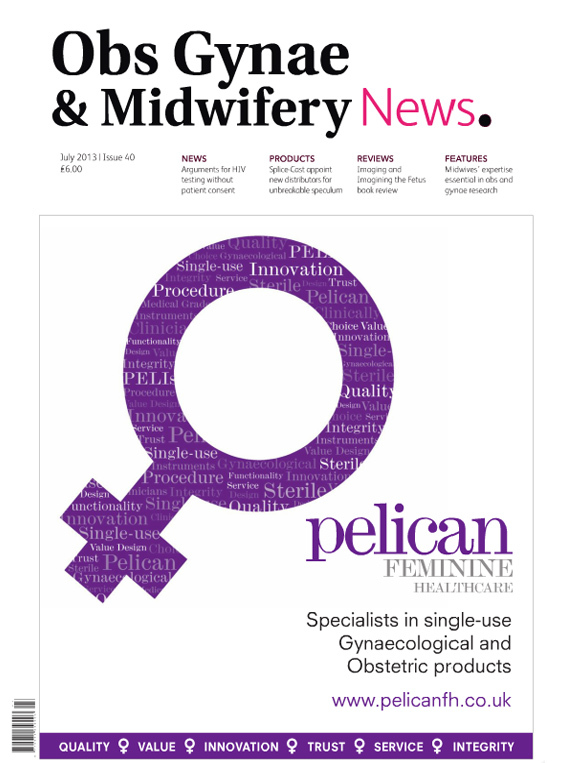 We have provided guidelines and recommendations to surgeons about who, when and why to revise. Our group is closely collaborating with MHRA and Beyond Compliance in order to improve the life of patients with orthopaedic implants. We have established an NHS service for retrieval analysis (www.rnoh.nhs.uk/our-services/retrieval-analysis), from secure storing of implants to detailed report on retrieval findings which can identify the cause of failure of the implant. Who says exercise is good for you? Wii do!